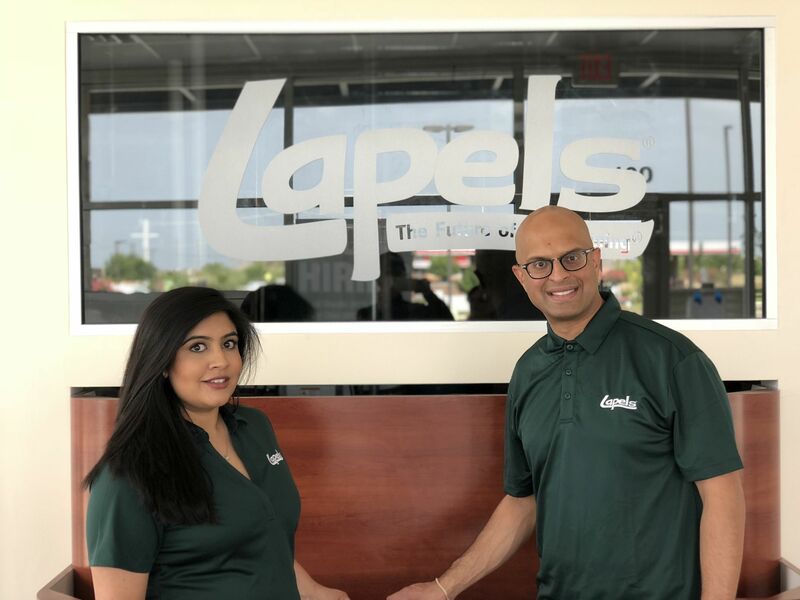 Lapels Dry Cleaning, an innovative, environmentally friendly dry-cleaning company headquartered in Hanover, Massachusetts, will open a full-service, environmentally friendly dry-cleaning satellite plant and store at 2180 FM 423, Suite 100, Little Elm, Texas on July 14. Additionally, the Modhas plan to open a Lapels Dry Cleaning satellite store at 4740 W University Drive, Prosper, TX 75078. Lapels has pioneered its eco-friendly dry-cleaning experience over the past two decades. Part of that effort includes a partnership agreement with GreenEarth®, the dry-cleaning industry’s only non-toxic cleaning alternative, for its newer locations like Lapels Dry Cleaning of Little Elm. Using these kinds of solutions and the latest technology in equipment, Lapels is one of the few dry cleaners able to boast that there is no hazardous waste in their process. Lapels offers it’s customers Automatic Rewards earning them credit towards free dry cleaning for every dollar they spend, Loyalty Programs, a VIP Program which eliminates the need to wait in line, the use of a 24 Hour Drop Off Service and FREE Home Delivery to all its customers. Same day service is also available with pick-up after 5 pm. Lapels also offers a “car hop” service where customers can drop off and pick up their clothing without ever leaving their cars. Hours at Lapels Dry Cleaning of Little Elm are Monday through Friday, 7 am to 7 pm; Saturday 8 am to 5 pm; and Sunday, 12 pm to 3 pm. Each Lapels Dry Cleaning store offers a full slate of services, including: same-day dry cleaning; shirt service; tailoring; shoe repair; wedding gown preservation; suede and leather processing; box storage and fur storage. Lapels Dry Cleaning has stores in Arizona (Gilbert, Chandler, Phoenix, Scottsdale), California (Gilroy, Hollister), Colorado (Littleton), Connecticut (Cromwell), Florida (Fleming Island, Orange Park, Tampa) Louisiana (Monroe, West Monroe, Delhi, Rayville, Winnsboro), Massachusetts (Abington, Allston, Bedford, Boston, Boston Seaport, South Boston, Brighton, Burlington, Canton, Cohasset, Dedham, Dover, Easton, Framingham, Hanover, Hingham, Kingston, North Andover, Malden, Marshfield, Martha’s Vineyard, Newtonville, Norton, Somerville, Stoughton, Walpole, Waltham, Wakefield, Wellesley, Westford, Westwood, West Roxbury and Wilmington), Michigan (Beverly Hills, Rochester Hills, West Bloomfield), Mississippi (New Albany, Tupelo, Oxford, Pontotoc), New Jersey (Brick, Somerville), Ohio (Liberty Township), Oklahoma (Edmond, Oklahoma City), Pennsylvania (Bloomsburg), South Carolina (Myrtle Beach, Pawleys Island), Tennessee (Arlington, Nashville, Franklin, Germantown), Texas (Bee Cave, Brownsville, Katy, Little Elm, Richmond, Spring). Additional locations are coming soon to Boston, MA, Latham, NY, Prosper, TX, Sugar Land, TX.